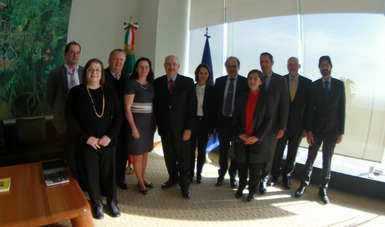 On November 29th and 30th, the Delegations of the European Union and Mexico held in Mexico City the sixth round of negotiations of political and cooperation issues within their new modernized agreement. During the process, negotiations were headed, on the Mexican side, by Amb. Carlos de Icaza, Deputy Minister of Foreign Relations, for political issues, and Amb. Agustín García López, Executive Director of the Mexican Cooperation Agency (AMEXCID), for cooperation issues. On the European side, Edita Hrdá, Managing Director for the Americas of the EEAS, is the Chief Negotiator of the European Union, and has had the collaboration of Jolita Butkeviciene, Director for Latin America in DG DEVCO. During the sixth round, both Delegations came to an agreement on all the political and cooperation issues not related to the ongoing trade and investment negotiations. The conclusion of these areas of the new agreement reaffirms the commitment of both parties to finalize negotiations overall by the end of this year. 2017 marks the 20th anniversary of the signing of the Global Agreement. Concluding the modernization of the bilateral legal framework will allow both parties to deepen and broaden their strategic relationship, based on the shared values of democracy, respect for human rights, the rule of law, free trade, sustainable development and international cooperation for peace and security. These values and principles are the reflection of our common cultural heritage and the deep historical and political ties that unite us. Through stronger economic, political and cooperation ties, Mexico and the EU will be better equipped to provide prosperity and shared well-being to our 626 million citizens. The new agreement will also enhance our partnership at the inter-regional and international level, allowing us to be more effective in facing the global challenges of an increasingly complex world.